We have a new audio recording with Brad Montgomery that you can listen to for free! Brad sold this on his website for $20, so grab it today before we realize that we’ve lost our minds. What is Comedy War Stories? If you’re like us, you love hearing crazy fiasco and disaster stories from folks about their jobs. You may also think it’s fun to her what comedians talk about when the show is over. And you may want to learn about the crazy things that happen to speakers on the way up the career ladder. Well, lucky you! We have a 65 minute audio recording that you’ll love. Corporate Comedian David Glickman and Brad Montgomery recorded a once-in-a-lifetime program when they were working together in California, and we’re lucky they got it on tape. The craziest thing that happened to Brad during his career when he worked for college audiences and what that has to do with pizza. This is a live recording, and it was one of those once-in-a-lifetime events that will never be repeated. The energy between these good friends is terrific, and the audience was having a blast. So, peek behind the curtain and learn what really happens in the sometimes not-so-glamorous world of show business. 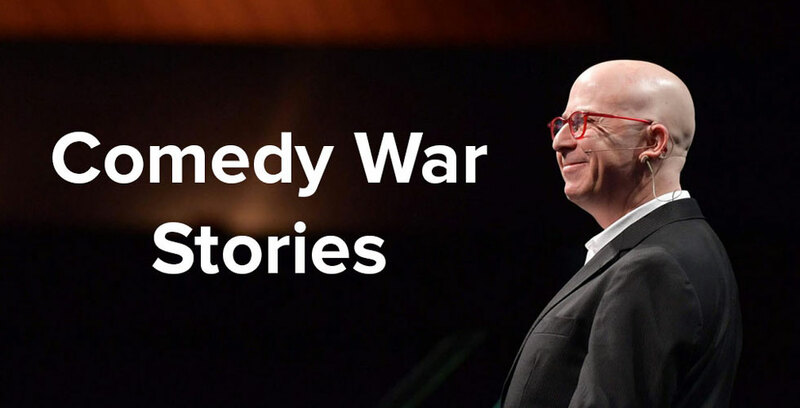 Get ready to laugh, because it’s Comedy War Stories with comedians Brad Montgomery & David Glickman.